A healthy home begins behind the drywall. We believe that by protecting the "unseen" wood structures behind the drywall promotes the first step toward maintaining a healthy environment for your family. 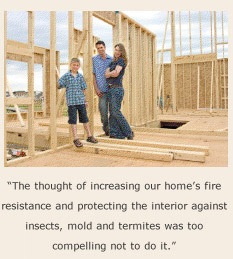 Once the wood framing is treated, you will never have to worry about toxic mold, termite infestation, rodent droppings or just the general filth that is associated with animal activity. Fire retardation is an added benefit that is a byproduct of our treatment application. Some insurance companies will offer a discount for homes that have applied a fire retardant to the wood framing of the home. Fire retardation also adds a layer of protection to the family and to irreplaceable items. Treatment is very affordable. 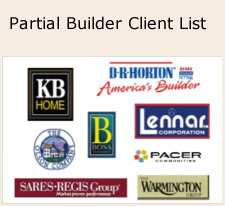 Ask your builder for a lumberGuard treatment today. LumberGuard's proprietary new generation of silicone polymers prevents and inhibits microbial infestation on all types of structural surfaces. The value of these new polymers is that they are non-toxic, non-leaching, non-migrating and are environmentally safe (EPA Registered). The primary mode of action is physical and not chemical. This means that treated surfaces will not lose their killing action over time and cannot be washed off. Microbes are killed by the polymer's surface composition, which acts like a sword, rupturing the microbe's outer cellular wall. This antimicrobial is applied using our specialized electrostatic misting technology, thus effectively coating all interior surfaces. "All Lumber Guard applicators pass a strict Company compliance test to ensure consistent high quality applications. Site preparation is the first step in the Lumber Guard application process. Removing existing contamination is the most important part of the application process."